UPDATED: Tue., Sept. 4, 2018, 6:36 p.m. The Spokesman-Review recently wrote about how Spokane-area activists and environmentalists say the baby orca death and J50’s health problems – and the threat to orca survival in general – highlight the political and biological connections between the Columbia River Basin and the Puget Sound. Since orcas primarily consume Chinook Salmon, attention is being paid to Colville Tribes and the Upper Columbia United Tribes who are trying to reintroduce salmon into the Columbia River. Biologists are worried that a young orca, a member of a species facing extinction in the Salish Sea, is at a greater risk of dying after falling so far behind her family that it hadn’t been sighted for more than three days. A team of veterinarians that suspect the whale is suffering from malnutrition, an infection and internal worms, moved Monday to give her some medicine, delivering a shot of antibiotics, according to the National Oceanic and Atmospheric Administration. The female killer whale, known as J50, was barely keeping up with her family on Thursday, when Canadian biologists lost track of her. She was spotted with her mother on Monday morning. “We were starting to fear the worst,” Michael Milstein, spokesman for NOAA, said on Monday. The orca, which is just over 3 years old, was reported at Hein Bank, south of San Juan Island, by multiple observers, he added. J50 is a member of the critically endangered population of southern resident killer whales, with just 75 members making up three pods: J, K, and L. Every animal’s life is closely tracked, so biologists were alarmed when J50 did not return on Sunday with the rest of her family to their foraging ground on the west side of San Juan Island. Researchers have documented her severe weight loss by drone photography and close-range visual inspection. She is feared to be near death because other whales in as poor body condition as hers have almost always died. 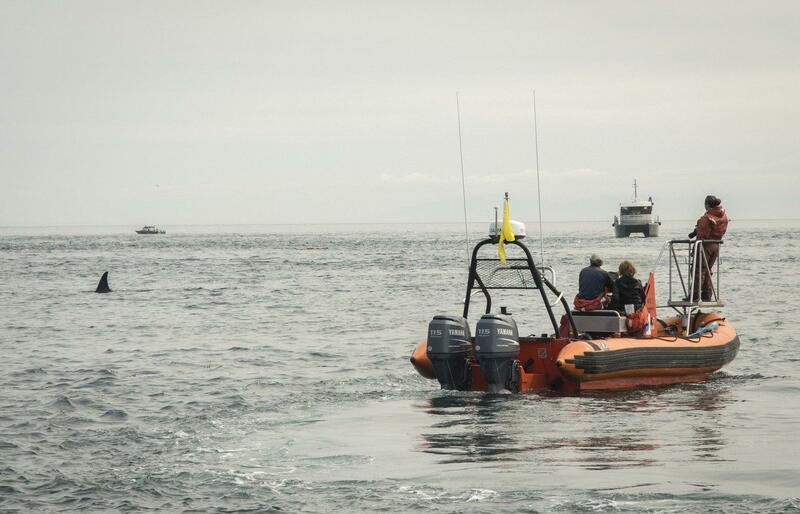 An international team of biologists, as well as the Lummi Nation, the Washington Department of Fish and Wildlife and King County have mobilized boats, fisheries staff, and orca experts in an unprecedented effort to try to help J50. One option, which has not yet been attempted, is to sluice live king salmon to her from the back of a boat as a way to get medicine into her, as well as critical hydration. J50 is also known as Scarlet, reflecting rake marks from killer whale teeth along her body that biologists noticed on her at birth. Some of them speculate she may have been born in a breech position, and midwifed out of her mother by other whales in her family. She was at first a spectacularly active orca, known for flinging herself fully out of the water, with her body in an arc, nose pointed to tail. “She is a spunky little thing, you’ll see her breach completely out of the water, her back arched, like she is flying,” Jeannie Hyde, who follows the southern residents closely for the Whale Museum at Friday Harbor, and writes a blog about the whales, said in an interview in August. Published: Sept. 4, 2018, 8:30 a.m. Updated: Sept. 4, 2018, 6:36 p.m.